Bon Jovi's latest CD doesn't hit store shelves until next month, but fans of this New Jersey based rock band don't have to wait until then to hear new music. The lead and title track of their latest album, Have a Nice Day (listen with WM) (Real) is available now on your radio stations and the video which just premiered on AOL first this past weekend should be seen on your video networks soon, if it isn't already. This isn't the first we've heard of this song however. A snippet of the song was played on stage at the AMA's, where Bon Jovi was awarded a special award of achievement. The full version of the song was also performed by the group at July's Live 8 concert where Bon Jovi was one of the first acts to take the stage at the US venue in Philadelphia. 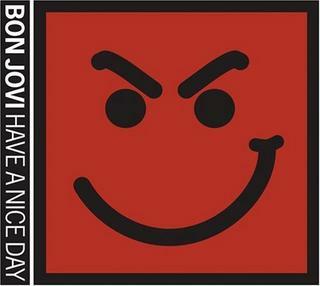 "Have a Nice Day" is a nice rock track that takes the band back to its roots. It is good song that clearly rocks and also delivers a positive message, even with a touch of sarcasm in the lyrics, about not giving up even when the world around you gets you down. The video available online for viewing both at the band's official site and on AOL here was filmed over five days in July in New York City and included both performance footage and video footage of the guys. The video has nothing to do with the song or the lyrics which are a bit sarcastic in tone, but the video and the song are both fun. 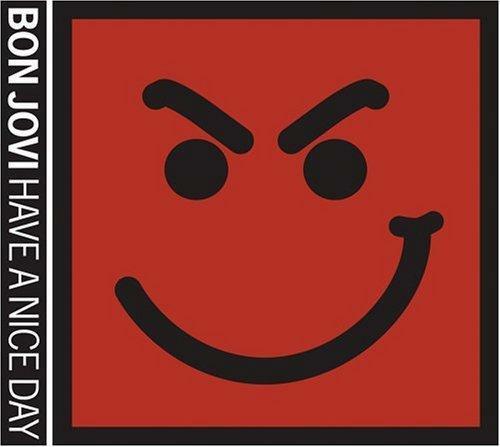 The video concept follows both Jon and the smiley face symbol located on the album's cover. Jon signs an autograph for a fan using the smiley, and the fan takes a picture of it. By the end of the video, the smiley is spray painted various places, on t-shirts, and even on a necklace around a girls neck much to Jon's and the rest of the band's amusement. Even with the video not following the lyrical content of the song, the video was just a good video. It was fun, and after twenty years of making music videos Bon Jovi seems to know what they are doing when it comes to making them. Bon Jovi is a good performance act as well, so any time you get to see this group on stage its a good thing. Those waiting to see a video for the second single off this CD will have to stop waiting. According to a recent interview, Jon Bon Jovi has said a second video will not be made and those production costs that would normally be used to film a video will instead be given to charity. The $450,000 costs will be used to help build homes for Habitat for Humanity in Philadelphia. The CD is set for release on the 20th of September in the US, with a release a week earlier in Japan. Bon Jovi does plan to tour to support this album with dates starting in November and going through December. At this point, the tour looks to be opening in Chicago. This E-card launches audio, video, and live versions of the song - check it out.